We celebrated my wife’s birthday in Paris, France this year and picked up some travelling tips along the way. If you’re thinking of going to France, speak English and not much French, some of these tips might help you plan for your trip. 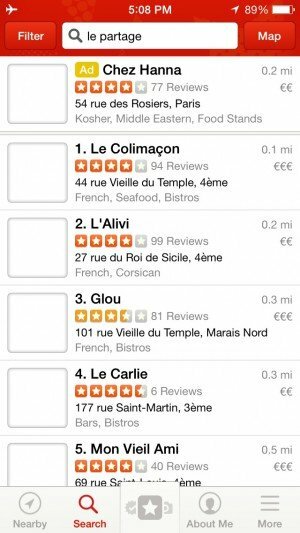 Buy the Global Plan, Download the Cell Provider App and the CityMaps2Go App and Paris Guide before leaving so you don’t get charged by your cell provider after arriving in Paris. Note: This article is a slight departure from my normal technical articles. Readers of my web collaboration tips may enjoy some of the technology related tips. My wife and I both activated temporary French mobile service on our respective providers. Mostly, we did it for emergency and to cover what we expected were unavoidable accidental uses of mobile services while we had our phones on for 5 days in France. For example, my wife got the mandatory voice mail each day from the elementary school for the 3 school days my daughter missed. I got a series of Easter texts from family. With the Global plans turned on, these calls and messages cost less than they would have without. In addition, the 100 MB of data came in handy for short bursts of helpful research on the go when we couldn’t find WiFi hotspots. I paid a one time fee of $30 for the AT&T Global Passport Plan that covers 30 days of travel and doesn’t change your regular plan in other ways. It inlcuded unlimited messaging, 120 MB of data and $1/minute calling. My wife paid a similar fee on Verizon which only included 100MB of data. Both were supposed to include WiFi service. Don’t count on it. 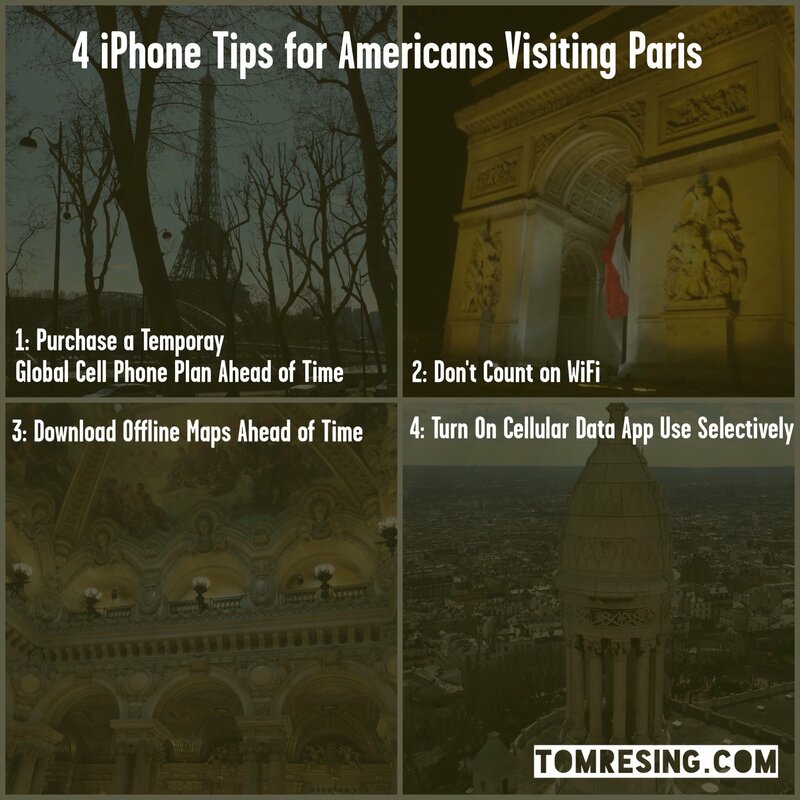 We didn’t find many WiFi hotspots in Paris, even with the suggested AT&T and Verizon Apps which were included with the Global plans and were meant to help find hotspots. The Hyatt WiFi was great. Other than that, Starbucks seemed to be the only reliable place to get WiFi. The museums had wifi to download their apps only. Le Pain Quotidien advertised Wifi and it didn’t work well. We got by with the WiFi at those few places we could find it, the 220MB of combined data we did have, used in a pinch, and one very handy app. My wife found the CityMaps2Go App on an promotion, so we had the paid version for free. Can’t speak to the free version, but the version we used costs $4.99 in the iOS App Store. 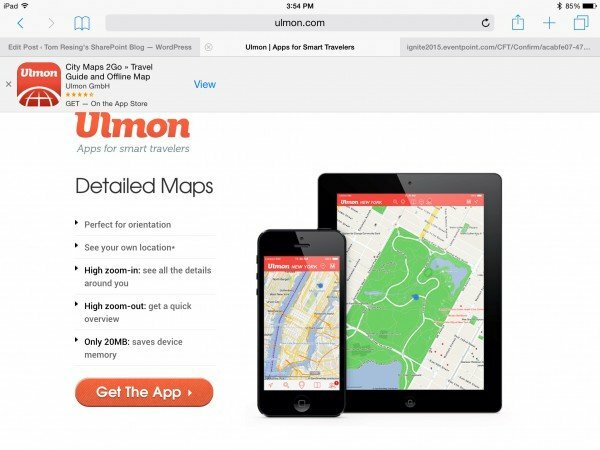 This app works a lot like Google Maps or iOS maps with one important difference. It works entirely offline, so you don’t need cellular data or WiFi to know where you are. If you used my tip above and have your global cellular plan on, you get the GPS position for free. On our iPhones, we could launch the app anywhere, anytime and not only find our exact position on the map but also the exact direction we were facing! 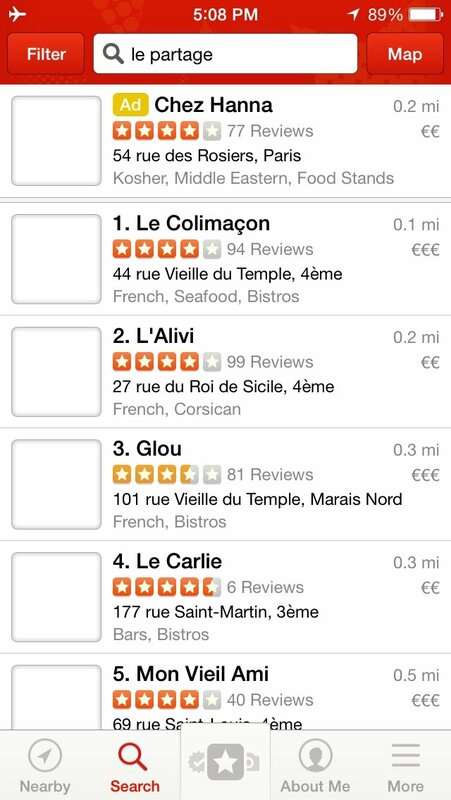 I can not tell you how handy this one app alone was in Paris. I had a number of other tourists ask my for help finding something they were only blocks away from with no other way to find it than asking for help. While that can be fun in it’s own right, it happens way too often, for me, and there isn’t always someone willing to help that knows the place you want to go. 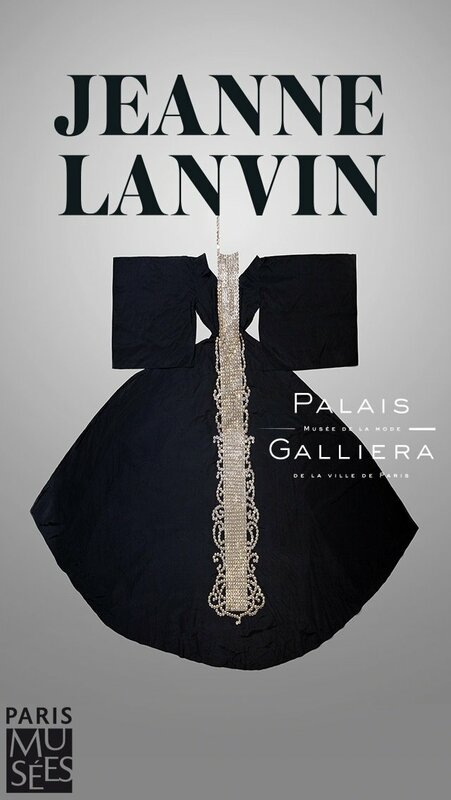 Make sure to download the Paris guide after you download the app and before you leave home. 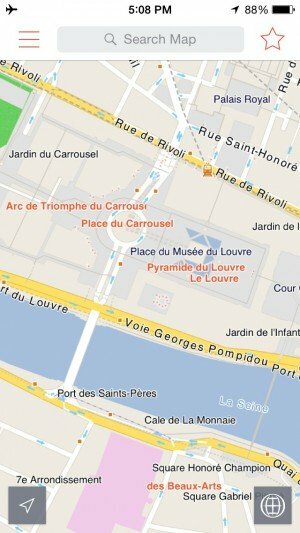 It has all the maps, like this one below and articles about museums, monuments and even some restaurants. Note that the Google Maps app also works a little in offline mode. This can be handy because I never found a way to list step by step directions in CityMaps2Go. I had some success mapping a route using the Metro on Google Maps while at the hotel or a Starbucks and then following along without data later. Be warned though, it was also easy to loose the directions with one click too many in the wrong direction, so it might be useful to snapshot the screen by holding the power button and the home button at the same time. Then you can find the directions offline in your Photos App. I’ll give full credit to this tip to the birthday girl. My wife told me on the plane while we were waiting to depart to turn cellular data use off on all my apps before going to Airplane Mode for the flight. After landing, while monitoring your data use (Dial *3282# on your phone to get your up to date global data use in MBs after landing), selectively turn on cellular data for apps you feel you need to use. 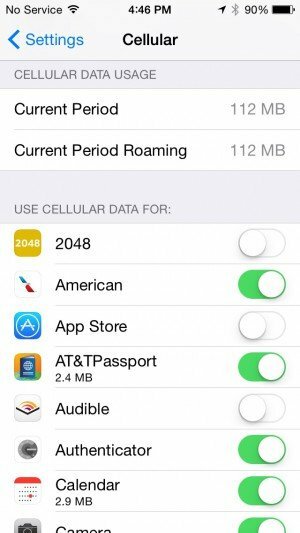 From iPhone Settings, go to Cellular, then scroll down until you see “Use Cellular Data for:” and then a list of all of your apps. 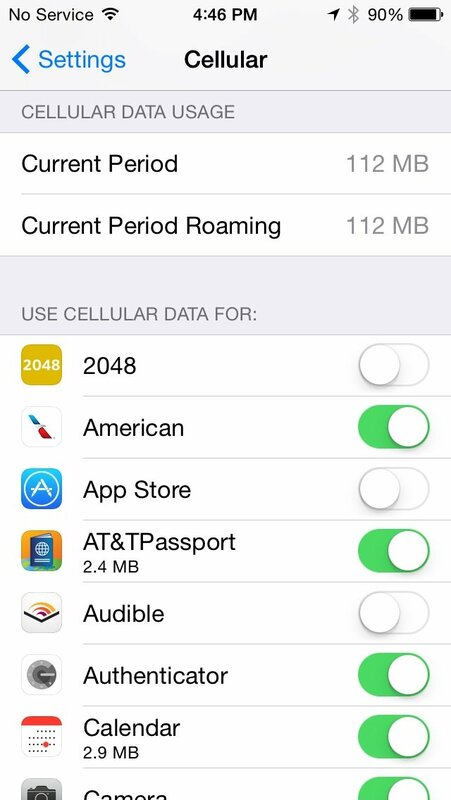 Next to each app, you can see the amount of data it’s used since you last reset the data statistics – if you ever have. I toggled off all of the big data hogs, then hit “Reset Statistics” on the bottom of the list. That way I could monitor after landing to see which apps were using the most of my precious few MBs of data service. One surprise? “System Services” which you can’t turn off, including iTunes, used 48 of the 112 MB I used while in Paris. I guess there’s only so much tuning you can do! While quite a lot of people speak at least some English at most of the major tourist attractions and restaurants, learning a little French couldn’t hurt. I recommend the free app Duolingo. 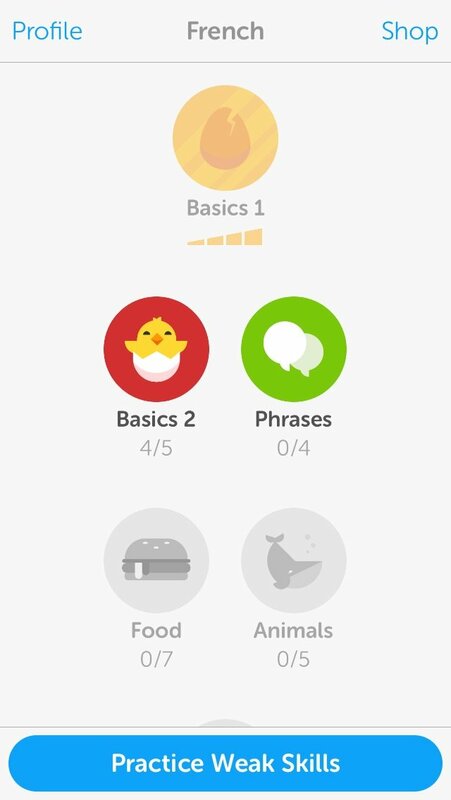 I studied French for a week before leaving the US and so did my 7 year old daughter using this app. Uber is very active in France. Download the app and toggle it on for cellular data usage. It’s not a data hog. While we took at least one Metro ride a day and walked for miles every day, we also took at least one Uber each day, including to and from the airport. One huge benefit of Uber is that you can enter your destination into the App. That, combined with the automatic payment through the app made it really easy to use the service even when the drivers spoke little English. Voila! We still have an iPod. If you download the United App to your iPhone, iPod or iPad before your flight, you can watch movies on-demand for free on some United flights, including one of our international legs. We forgot to download it on some of our devices, so we were limited to the one, my phone, which did have it since I’m a United frequent flyer. Other airlines’ apps might have something similar, but I’m not sure. On our other flight, we didn’t need the app because the movies were on the seatbacks. I think that’s how a lot of the planes are. We visited the Palais Galliera to see the Jeanne Lanvin exhibit. At the museum, there was a WiFi hotspot. All it would allow us to do is download the companion app for the exhibit which is a nice way to follow up on the costumes and designs. 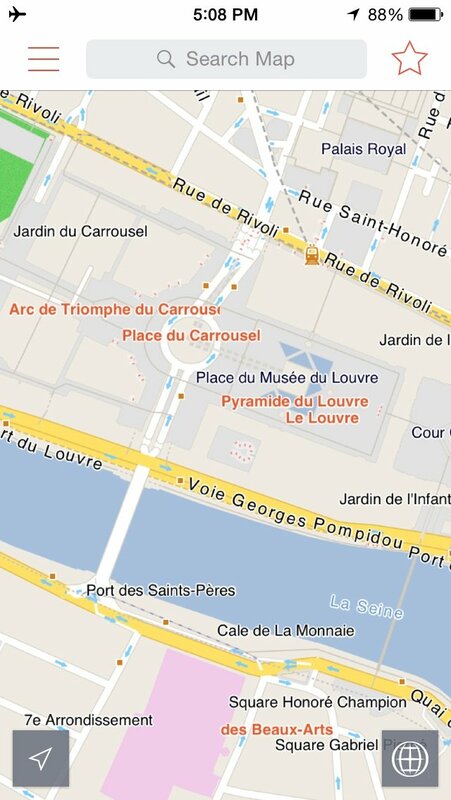 At the Louvre, there was a similar app. Thank you so much for detailed information and valuable tips. We are planning to visit Paris and London next week. All your tips are great help and make me prepare better. Thanks for sharing them.God bless. Thanks, Sunny. Hope your trip was great! Thanks, Bob. Have a great trip and congratulations on 50 years! Very helpful information. We are leaving for a two week tour of France in three weeks to celebrate our 49th snniversary. We’ll be on a Rhone River cruise for 1 week. That should have been 40th anniversary. Congratulations on 40 years! Enjoy France. Thanks for reading and commenting. Perfect post! We are leaving for Paris and London with our 18 year old granddaughter in 3 days. Now, I need to find similar info for London! I’ve travelled to London recently, too. The offline mapping tip can serve you well in London. Cell phone plans are better there, for Americans, if I remember. Safe travels! Hi! Thank you for the tips. Did you need an Adapter to charge your iphone in Paris? Thanks! Yes and no. Some places may have USB outlets which you can plug into. And hotels may lend adapters or sell them inexpensively. Just returned from Paris. Got this message too late, but the advice rings true. 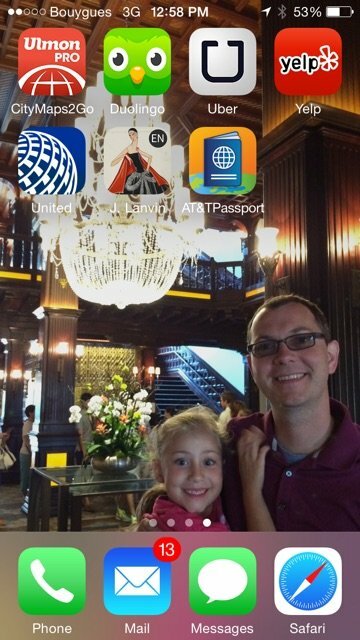 We did the ATT passport silver plan and it seems to have worked fine… pending the final bill next month. One thing is not covered. We had trouble finding the correct prefix / country code combinations, even for known good numbers. ATT 611 service had long wait times, and hung up on us. It was even more difficult when calling Switzerland (airport car rental) from France. The guidance on the internet is not always correct. We did find IPhone to iPhone (US phones) worked seamlessly. (Often popped up “dial assist”), but just dial like you do in the USA and wait for a few clicking sounds and it connects.